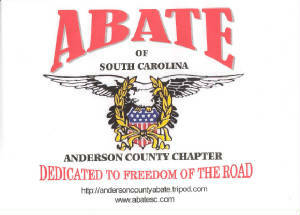 ABATE is a motorcyclists rights organization (MRO); founded to protect and defend the rights of motorcycle riders. There are chapters in just about every state in the Union. We've seen this chapter grow and shrink and grow again. Right now, we maintain between 40 and 60 members. You might ask, "Why do we need ABATE in South Carolina? We don't have a mandatory helmet law." Well, ABATE is the reason we don't have a mandatory helmet law. It was members of ABATE who were successful back in 1980 in getting the helmet law amended to allow freedom of choice for adults. And if we relax and do not remain vigilant, those in power in this state who think they know what's "best" for us will have us wearing helmets again! ABATE of South Carolina is working to enact legislation against biker discrimination in public places and in the workplace and working for tougher penalties for right-of-way violators that cause accidents which result in injury, maiming or the death of the victim. For complete details on these issues and to keep up with other ABATE of South Carolina matters, please visit www.abatesc.com. Anderson Chapter meetings are held the third Sunday of each month at 1:00 p.m. at The VFW Post on Hwy. 29 North in Anderson. We hope you like what you see and we welcome you to join us. Chapter Meetings are held at 1:00 p.m. on the 3rd Sunday of each month at the VFW Post on Hwy. 29 North.